Today Mutant League Football’s violent game play seems silly and cartoonish, but back in 1993 it landed the game in hot water. MLF was caught up in the same furor as other titles like Mortal Kombat during the first real video gaming backlash in the early 90’s. Underneath the blood and guts however lies a solid game that makes for a nice break from more “serious” football titles. The game was built with the Madden 93 engine, so regulars of the franchise should feel right at home, but dirty plays such as bribing or killing the ref and killing the opposing players are not only available but are essential to winning the game. MLF’s 50+ plays make the game feel like a robust football title. Unfortunately, just like Madden 93, the game’s passing windows give little indication of the receiver’s location on the field, so you have to either memorize the routes of the three receivers (which is fine if you play the game a lot), or just chuck it to the open player and worry about his location after he catches it. With the Madden series, you can just play a later release and be done with the passing windows, but as this was the only release of MLF, you have no choice but to live with them, and this is the game’s most obvious fault. If you like football games, then Mutant League Football will be a fun diversion from the norm. If however sports games aren’t your thing, then there’s nothing to see here. 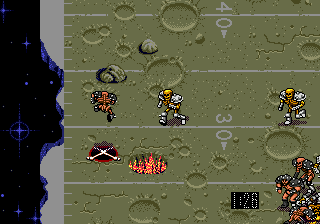 Buy Mutant League Football on GameGavel or Amazon. Tagged Football, genesis, Mutant League Football, Review, sega, Sports. Bookmark the permalink.